So, that's how I ended up with a jumbo pack of Upper Deck Series Two hockey. There are a few Blackhawks cards contained within the second edition of UD's NHL flagship set that I need for my Blackhawks All-Time Roster Collection, so it seemed like a rational compromise to this frustrated consumer. Still, seriously, Heritage has been out for over a week... come on guys. 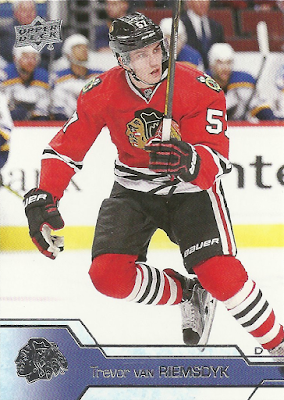 Well - I pulled myself one Blackhawk base card in Trevor van Riemsdyk. A few weeks ago, this would have been a major pull for me, as I've been chasing a card of the young defenseman for a little while now. 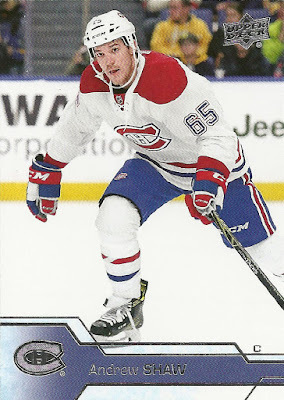 However, Kin, of I Feel Like a Collector Again and Bean's Ballcard Blog fame kindly provided his 2015-16 OPC rookie card for me, as part of a larger, supremely generous trade. You're a day late and a dollar short, jumbo pack. That's okay though, it's always nice to have a backup. While Trevor was the only Hawks base card that I pulled, I also came across a handful of ex-Chicagoans in Patrick Sharp, Andrew Shaw and Craig Anderson. It's still bizarre to see such former franchise stalwarts as Sharpie and Shawzie in different colors. On the other hand, Anderson's Blackhawks tenure fell in the thick of the team's darkest days, when neither I nor most of Chicago was many any attention to the club named the worst franchise in sports by ESPN. 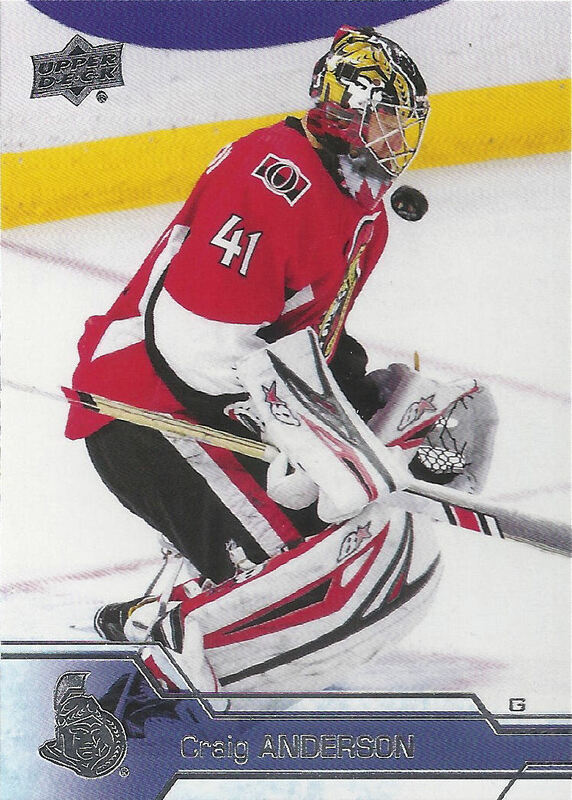 Therefore, seeing the netminder dressed in Senators garb is far from unsettling. However, it must have been unsettling for him to have to block that puck with his face. At any rate, much like I do with former/future Cubs in my "Cubs of a Different Color" collection, I like to hang on to cards which feature Hawks in other uniforms, as well. So, these three will be filed away for a similar collection. That did it for base cards in the jumbo. There wasn't anything too special; but, it was far from my worst rip ever. We're shooting straight up the middle of the road here. 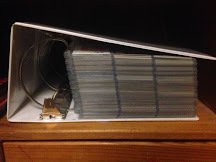 That's just the base cards though - perhaps I scored a sweet insert or Young Gun to sweeten the pot? 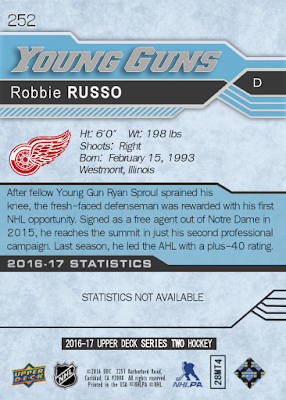 Robbie Russo was just called up by the Detroit Red Wings on Monday to replace injured defender Ryan Sproul. The Notre Dame grad made his NHL debut in in Tuesday's 3-2 loss to the Maple Leafs. Ordinarily a Red Wings card would illicit the same reaction as a Cardinals card would from me (ick), but this one is different. Why's that? Well, allow me to explain. First, the photograph features a cameo by the Blackhawks in an exhibition match up. Plus, as you might see on the back, Robbie hails from nearby Westmont, Illinois. Furthermore, his aunt is my former seventh grade Language Arts teacher and current co-worker. This woman helped to shape my young mind and even attended my wedding, so it's hard not to root for her skating nephew, despite team allegiances. Plus, this is the closest, personal connection that I have to a professional athlete. 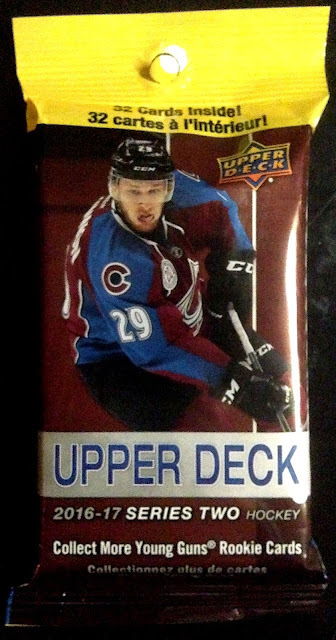 Also, full confession, the card you see above did NOT actually come out of my UD jumbo pack... it's a custom that I created myself, last night. 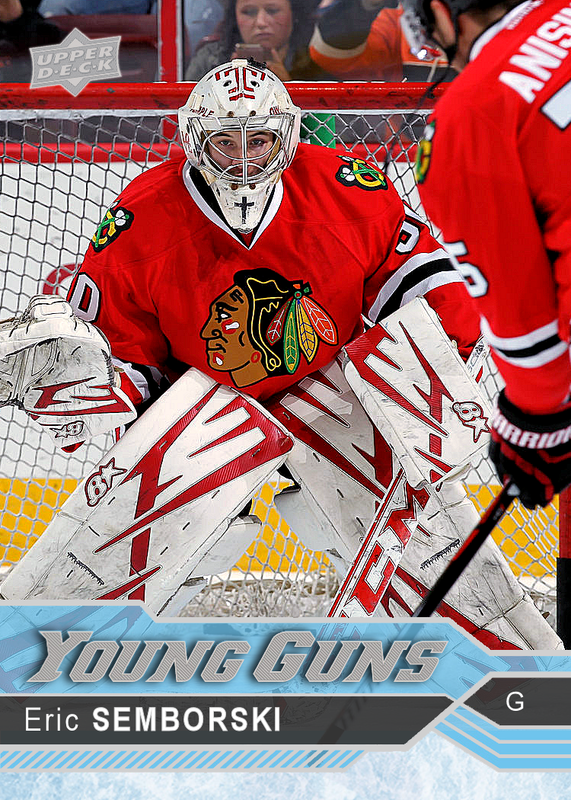 If you recall, when the Blackhawks were forced to sign emergency back-up goalie Eric Semborski off of the street earlier this season, I created a "Young Guns" card to commemorate his extremely brief NHL career (as seen above). With that template still sitting in a folder on my desktop, I couldn't help but dust it off for my co-worker's nephew. 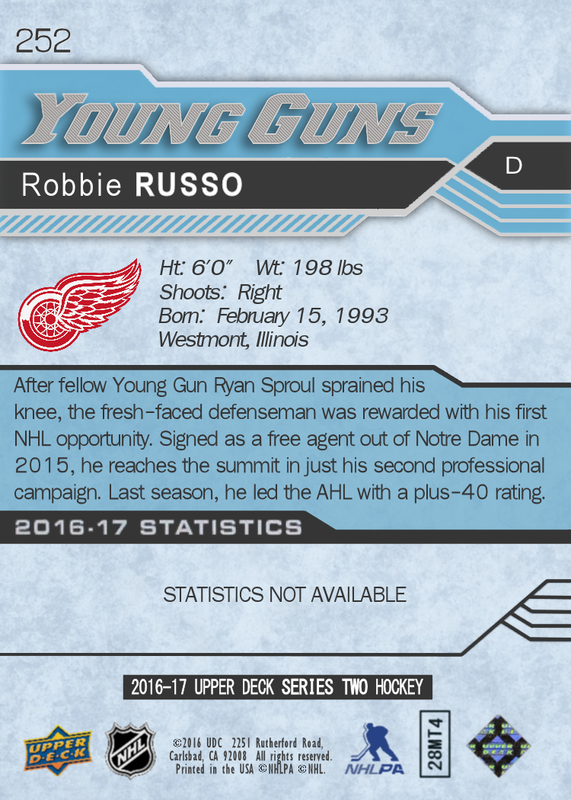 A few tweaks was all it took to get Robbie his "first" NHL "card." 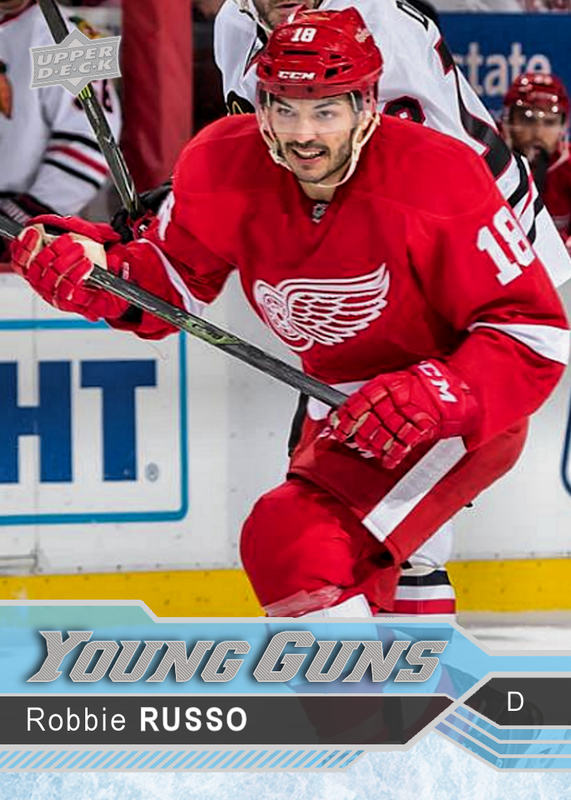 In reality, I netted exactly zero Young Guns (or inserts) from my frustration-induced purchase - sad days, indeed. 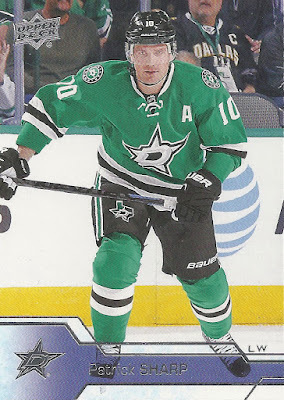 Additionally, while I was lucky enough to find a sampling of cards for my Blackhawks player collections, I wasn't fortunate enough to land any of the Hawks that I was chasing. C'est la vie. At least it provided me the content for a post and an avenue to show off my latest custom card, which really wouldn't have merited a blog entry on it's own. I have yet to get any Series 1 or Series 2 hockey this year or any Heritage but that looks like it was a fun rip regardless. You fooled me with the Semborski. Hey, Hey - What a Thrift Shop Find! "Rounding Third, He Was Headed for Home"